If you're looking for 80mm thermal receipt paper for your printer, PrinterStock.com has you covered! These 3 1/8 thermal paper rolls feature a one-ply design They're made out of BPA-free paper, making them environmentally friendly. Each box contains 50 thermal printer rolls, so you can quickly and easily stock up on what you need to keep your business running smoothly. Plus at PrinterStock.com, we are committed to bringing our valued customers the most competitive prices. 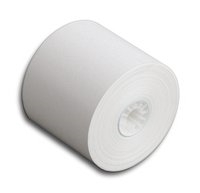 Our BPA-free white thermal paper rolls are affordably priced with discounts for bulk orders. These white thermal printer rolls (80mm) feature exceptional quality, so you don't have to worry about them tearing off messily or otherwise causing problems during business operations. The high-quality 80mm thermal receipt paper in these rolls is designed to keep paper jams at bay, so your cashiers can be as productive as possible. Since these rolls are made out of BPA-free paper, they can safely be handled time and time again. PrinterStock.com is pleased to offer this top-quality receipt paper for rock-bottom prices. Thanks to our central location, orders are delivered quickly around the country. Place your order now! Call our receipt printer supplies specialist with any questions toll free at 800-569-9849.